After last weekend, it seems like everyone wants a connection to England's glamorous House of Windsor. 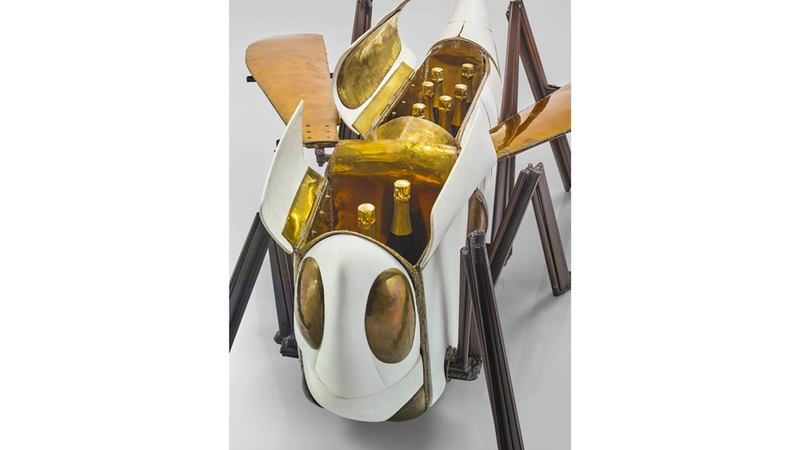 With another wedding far off and all the guesswork about the honeymoon circulating, the next best opportunity is to claim a piece with a royal relative: François-Xavier Lalanne's Sauterelle Bar (1970), which is being offered by Sotheby's in its New York design sale starting May 25. This bar, it seems, is one of only two that were ever made. Its twin is owned by Queen Elizabeth II, having been gifted to her and the Duke of Edinburgh by French president Georges Pompidou in 1972. This piece hails from a private French collection. It was previously sold at Sotheby's in Paris in 2009 for AU$995,859/£563,629 and could very likely fetch more given the current royal mania. But the work is special beyond the Crown’s association. The larger-than-life grasshopper is made of Sèvres porcelain and polished brass. It opens to reveal two capacious hinged compartments for bottles of libations and beverage glasses, while its wings do double duty as drink trays. "Over the course of his long career, Lalanne delighted in creating sculptural interpretations of the natural world," says Kimberly Miller, a specialist at the house, adding that many of his works are rarely what they seem. "Lalanne rejected the notion that art and decoration were mutually exclusive and created works that were as functional as they were fantastic," she explains, citing his famous sheep, which serve as extra seating, and a sculptured gorilla, which opens to reveal a safe. "The Sauterelle Bar is a true fusion of art and design. Being not only intriguing and sculptural but also creative and functional, it offers a duality you rarely get with other designers." The whimsical work, which carries an estimate of AU$1,056,439/£597,783 to AU$1.58/£856,345, leads a 182-lot sale that also includes a suite of five clerestory windows designed by Frank Lloyd Wright for the Avery Coonley Playhouse in Riverside, Illinois. Like the sea creature, it also glows in the dark. Style-conscious homeowners are paying consultants to find the perfect Instagrammable wall colour.